The metal on metal coupling produces significantly less wear than a metal on polyethylene coupling. 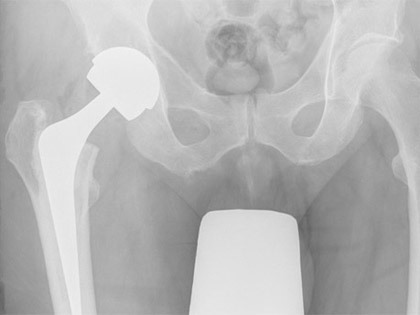 Typical average volumetric wear from a standard metal femoral head of 28mm diameter articulating with a plastic socket is in the region of 80 cubic millimetres per year and in comparison the wear from a metal on metal joint is in the region of 1 cubic millimetre per year. Ceramic wear is about 10 fold less. Although the volumetric wear is considerably less the particles are really quite small, in the region of a nanometer compared to microns from the polyethylene. A local tissue reaction from these metal particles is generally much less than the polyethylene although as the particles are smaller they can travel to distant parts of the body. This may be good or it may be bad. It may be good because as the particles are transported away from the articular surface and from the joint they may cause less damage to the fixation of the implant and therefore causing a dilution of the effects. However, the long term accumulation of this metal is unknown. However, about 80 per cent of the metal plus is excreted in the kidneys. Lubrication regimes of a metal on metal implant are very different from the metal on plastic implants. The large surface areas and very small clearances, that is the gap or different radius or diameter of the femoral component to the acetabular component can allow fluid entrapment and therefore achieving a different lubrication regime - hydrodynamic lubrication versus the boundary lubrication of a dry joint. If fluid is allowed to ingress and is maintained then theoretically the metal surfaces are separated and therefore wear becomes minimal. It is more likely that part hydrodynamic and part boundary lubrications exist in these metal metal joints. 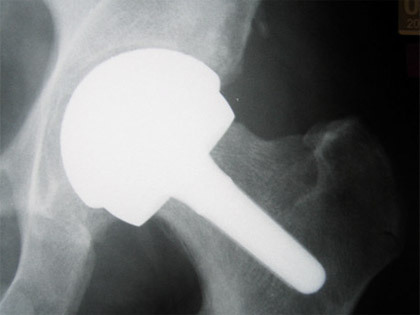 The metal on metal combination can be used as a resurfacing or in combination with a standard femoral stem with a large femoral metal head articulating with a metal socket. X-Ray showing Birmingham hip resurfacing. X-Ray showing standard femoral stem with large metal head articulating with metal socket. X-ray showing a Birmingham Mid Head Resection. The larger stem on the femoral component can be seen in comparison to the standard resurfacing. 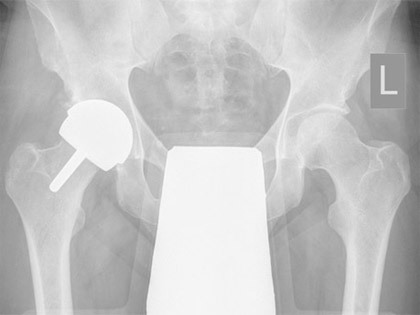 X-ray showing fracture of the femoral neck in a patient with a hip resurfacing. 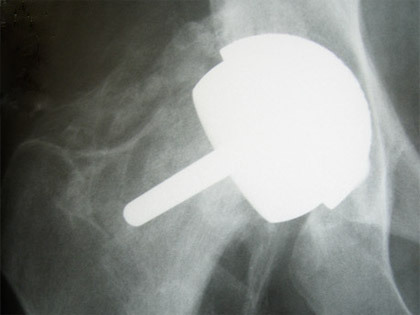 Heterotopic ossification (new bone formation) has also occurred around the hip.